I painted up these three as part of my TT project. These guys are really well cast with some nice details on their armor and weapons. 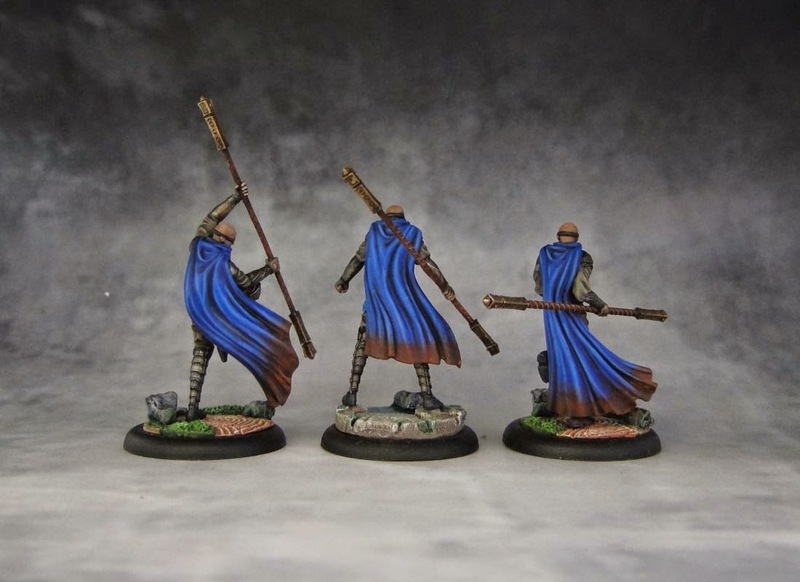 I'm not completely sold on their cloaks though, they look a tad unnatural to me. I used Zen base inserts for them. I like the fact that they turn out so bright. That helps liven up the whole piece a little. I typically paint using darker, toned down colors so doing the bases with brighter colors is what I might just try long term as it nicely sets the whole miniature. I played a little with brown glazes and silver highlights on their armors and I'm quite happy with the result. I used gold on their staffs on purpose. While I realize that it's a relatively soft metal and no one would use it as a weapon (especially a blunt one), these gyus are not really fighters. Read on to learn why. 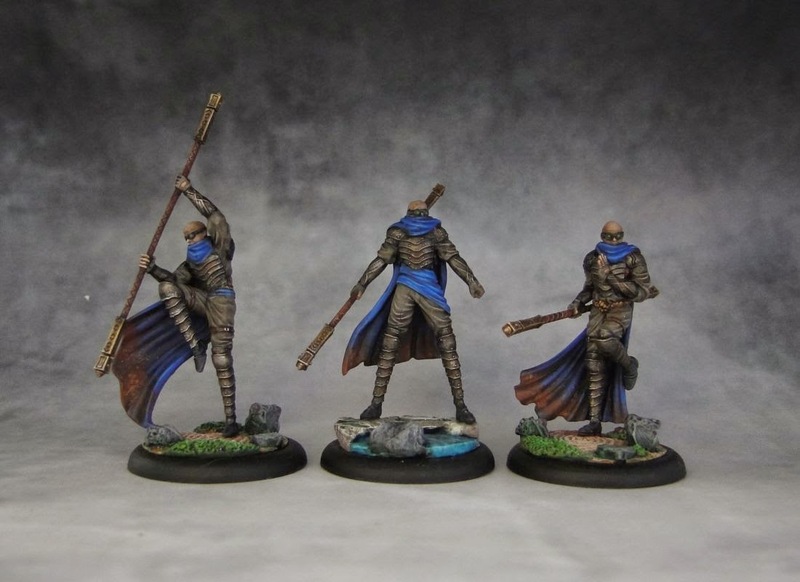 The Monks of Low River are some of the cheapest models available for Ten Thunders. At 4 SS they bring in some mobility, debuffing, pretty solid resistance (they're immune to Poison, Burning and Slow) to damage and... no damage output. I can see them as debuffers and minions used to lock other, more powerful ones in melee. With their nice defensive tricks they could be used to tie dangerous opponents and buy time for the rest of the crew. Tricky models to use to say the least. Your posts suddenly stopped appearing in my reading list (probably the fact the blog's name changed confused Blogger severely), so I seem to have missed a couple. Anyways, fine yellow again on the TT Archers. Nice bases, too. 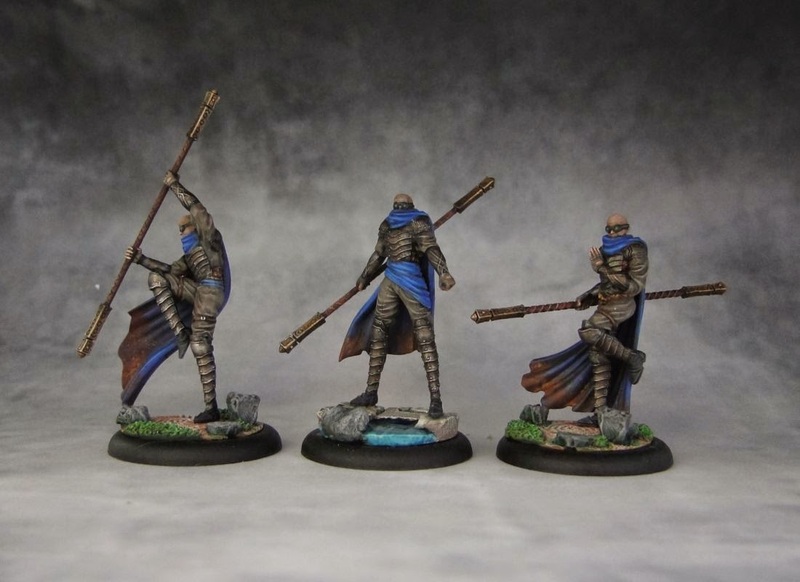 :) As for the Monks: I'm not fond of the sculpts at all, but you've done a excellent job painting them.